In this step you will use the Integrator Studio to create a new Solution in the Project that was created for the SOAP Server in INT009A – SOAP Service – Define Server. The new solution will hold the SOAP Agent details. 2. Select Solutions, and select New Solution from the context menu to open the New Solution dialog box. a. 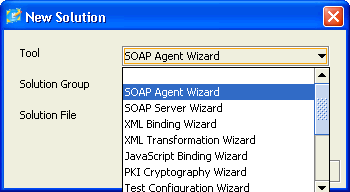 Select the SOAP Agent Wizard as the Tool from the dropdown list. b. Enter the name of the Group which is to contain this solution, in this case EmployeeAgent. You could select from an existing Group from the dropdown list. c. Enter the name for the solution in File, in this case iiiEmployeeAgent. This name will be used for the Project File. It will also be used by the SOAP Wizard as a prefix for some of the objects that it generates to support the solution. LANSA Integrator then displays the New SOAP Agent Project dialog box. The fundamental pre-requisite for any SOAP Agent Project is to have the WSDL file that describes the web service you want to use. WSDL stands for Web Services Description Language and is a universal language used to describe a web service. The file, or its location, is provided by the organization that publishes the web service. 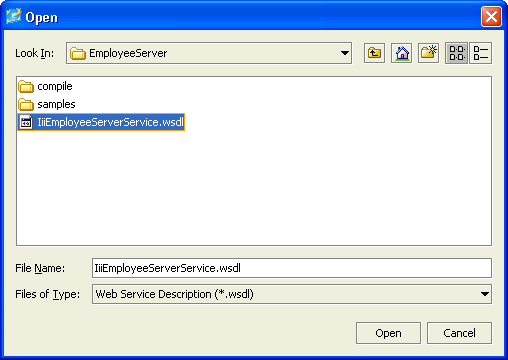 In this case, the WSDL file was created in INT009A – SOAP Service – Define Server. 5. Locate the WSDL Source file. a. Click the Browse button of the New SOAP Agent Project dialog box. The Select WSDL dialog is opened. b. If you know the WSDL file's path and name, enter it here otherwise press the Browse button to search for it. The WSDL file will be in the Solutions / EmployeeServer folder. c. Select the WSDL file and click the Open button. You are returned to the Select WSDL dialog box. You are returned to the New SOAP Agent Project dialog where the WSDL Source file's path and file name will be displayed. 6. Click OK to return to the LANSA Integrator SOAP Wizard. 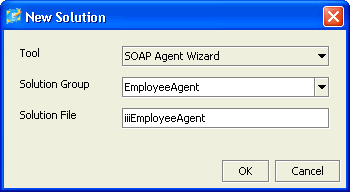 LANSA Integrator has filled in the fields of the SOAP Wizard dialog with default values. 7. Change the Package name. 8. Save your changes and leave the SOAP Wizard open.